One day @ a time: Travel Tales.. I am generally 'confusious'. The travel photo contest from supported by only added to my confusion. What kind of photos should one choose for a travel photo contest? My 'confusionism' gave birth to two schools of thought. Should I use good pictures clicked during a trip, which says nothing about the location? OR should I use an almost subject-less, bland picture of a mountain or a river or a beach? But as his holiness swami Nithyananda supposedly said, 'Why starve when you can have the cake and eat it too'? So I decided to pick pictures which qualify under both the schools, those with some character, at least compared to the rest of the lot. Here they are..
At 1,930 meters, Mullayanagiri is the highest peak between the Himalayas and the Nilgiris. One foggy afternoon in 2008, we reached there and found a herd of cattle grazing on the top. We always use the phrase 'like a herd of cattle', to describe an unruly crowd which behaves without discipline. But this was one exceptional herd we found there, all of them facing North and eating quietly like a bunch of school kids in the hostel cafeteria. 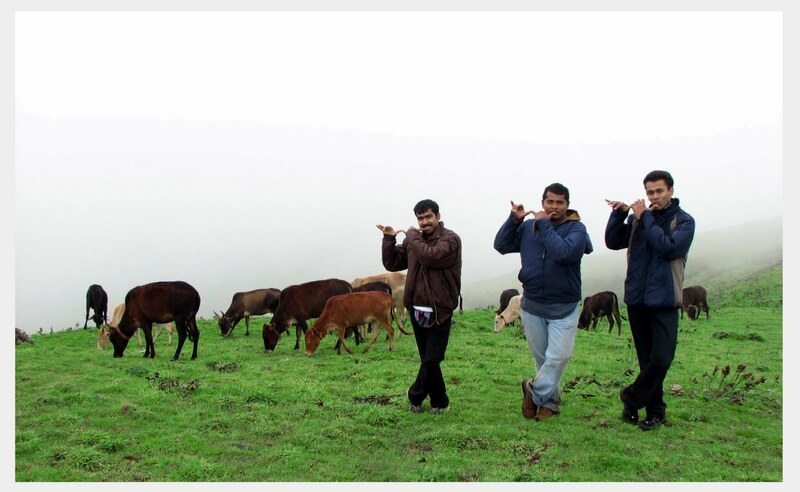 The lush green carpet of grass, the refrshing cool mist and the gentle wind had a magical effect on us and the three of my friends - Latheesh, Bijesh & Cyril - posed for this picture. More on the trek here. Snowie took it to his heart when Matt Monroe sang this song. Meet Snowie the snowman. 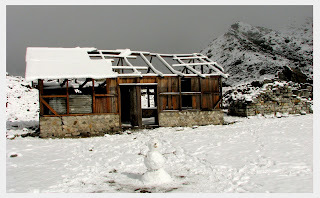 That is his house behind him at Samiti Lake (4,200m) in West Sikkim. We were on a trek to Goecha La Pass and reached Samiti lake by 4 in the morning. 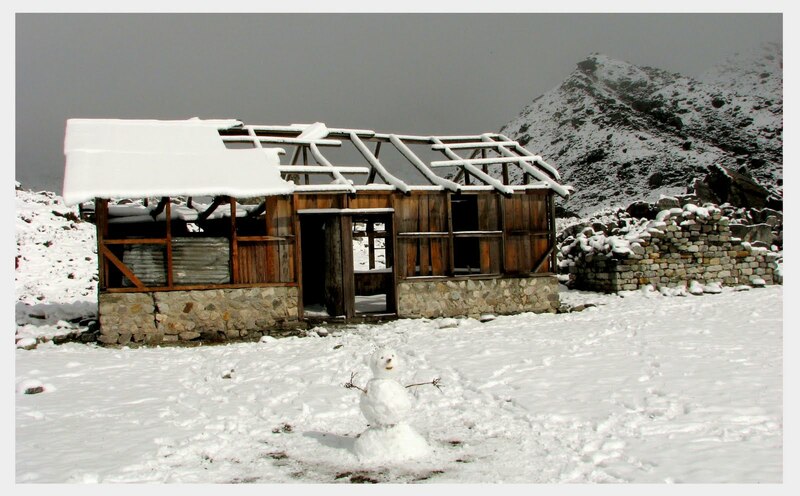 The snow clad mountains and the cabin by the lake looked so beautiful that we decided to bring Snowie back to life. After an hour's effort there stood Snowie admiring the landscape, with a smile on his face! He knew he has to melt away as the sun comes up in the sky, but the thought didn't dampen his enthusiasm even a bit. 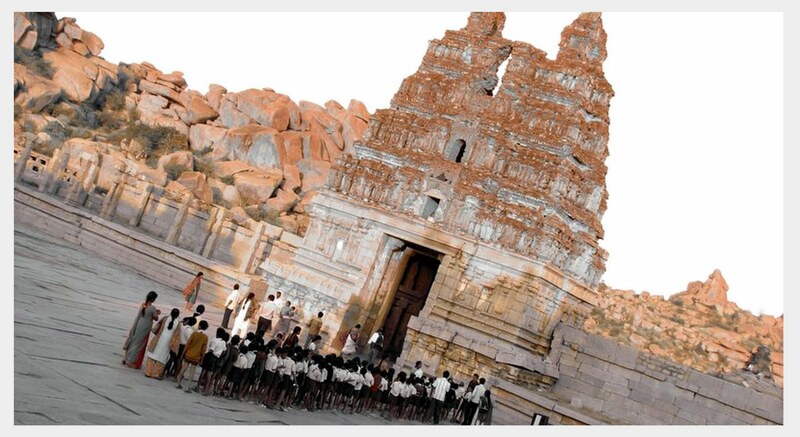 This was a nostalgic moment for me, seeing the kids standing in line by the eastern entrance tower of Vithala temple in Hampi. Reminded me of the excursions from school, when we were a bunch of innocent, carefree kids. While the regular crowd walked around the temple showcasing the irresponsible behavior so typical of the grown ups, this group of school kids marched in like a battalion of soldiers, listening eagerly to the guide, and jotting down notes. With their brown shorts and skirts, they blended quite well into the landscape of ruins. I thought this would be far better a click while everyone ran around the stone chariot and musical pillars. Hampi is in North karnataka and was the former capital of the Vijayanagara Empire. More on our adventures in the Monkey Kingdom. At an altitude of 3,420 meters on the confluence of the Saraswati and the Alaknanda streams is Mana, the last border village of India in Uttaranchal. Legend says that, Maharishi Vyasa and Lord Ganesh lived in a cave located here, for writing the epic Mahabaratha. The trek to Vasudhara falls, which is on the 'Swargarohan Route' of the Pandavas starts from Mana. After the Valley of Flowers, Hemkund glacier lake and Auli, the falls was our next destination. Mana is about 3 kilometers from Badrinath, and we decided to walk down to this beautiful village of the Bhutias. This picture was an attempt to capture the view we were rewarded with en-route. Being a border village, the military presence here is considerable. The ITBP barracks by the potato fields looked beautiful against the backdrop of the Gharwal range of the Himalayas. 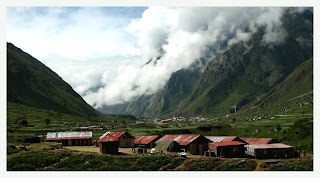 More on the Valley of Flowers trek. It is not just the love of Coorgi pork that made me travel to Thadiyandamol a fifth time. Thadiyandamol is the largest peak in Coorg and the second largest in Karnataka. This trip was special as it was a full moon night as well, something that brought out the lunacy in all of us a tad better. 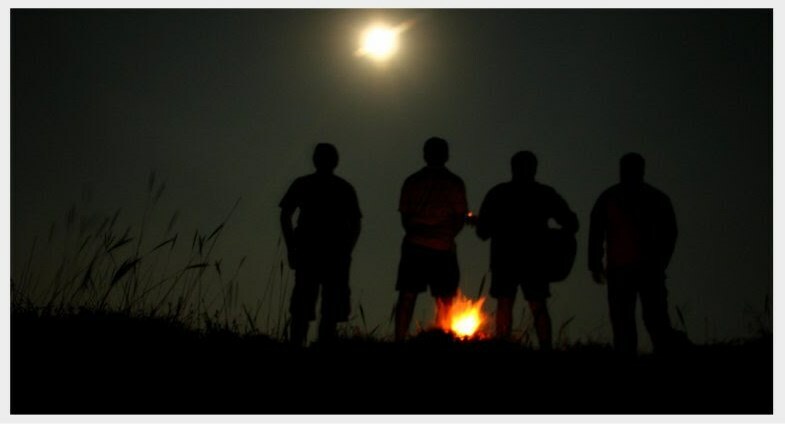 Camp on a mountain, full moon night, guitar, harmonica, fried pork, fire, a bottle of Jack Daniels.. you get the point! 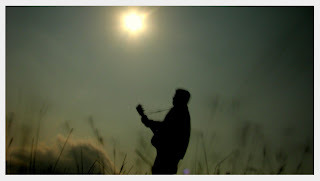 As the moon slowly rose up in the sky, my friend Sherwin stood up with the guitar. Facing the cloud filled valley he sang..
Let me see what spring is like, On Jupiter and Mars"
Nothing enriches life like travel. Every time you venture out of the four concrete walls that surrounds you otherwise, you get another quick lesson in life. The places you go and the people you meet always have something new to offer. That is probably why I always look out for an excuse to travel. And what better way to relive those moments again than pixellating the beauty as best as you can! Great collection! Very well captured and described. Good luck.